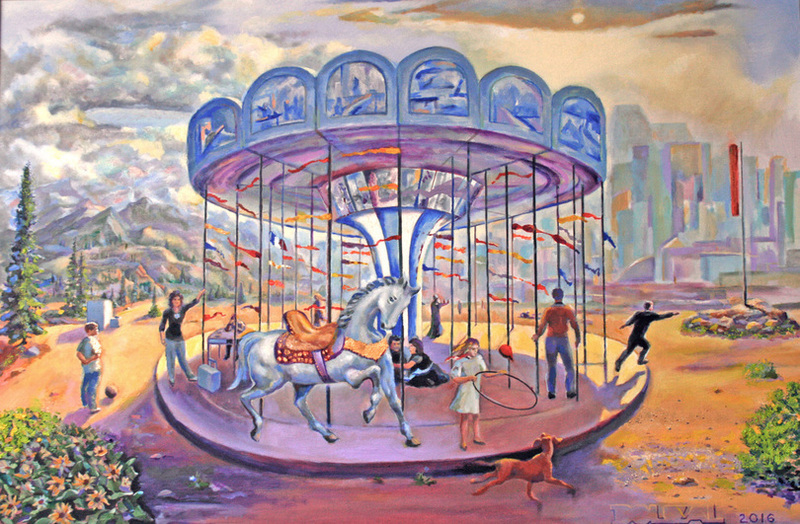 Carousels go around and around, always ending up where they started, similar to our daily habits. In the beginning, as with many things, it’s fun until we realize that no progress is being made. At this point, the ride has become monotonous, restrictive or even abusive. The figures in the painting are reviewing their present life situation. In the background, the man wearing out-of-date clothing stretches his hands forward as if to repel any new thoughts that threaten his existence. Another man sits at a table with his head in his hands, bemoaning regrets and missed opportunities. The standing woman clutching the pole has her suitcase packed and is planning a change but hasn’t yet found the courage to let go of the past. Another woman kneels to offer assistance to a man who is unable to get up and get off. She chooses to stay on the carousel, bound by her obligation to be of service. The young girl holding a hoop in the air foreshadows her future trip on the carousel. In the right foreground, a man jumps off because he realizes he has had enough and is ready to leave behind all of which no longer serves him. The small boy standing on the ground watches the repetitive scene, a symbol of the neutral observer, who without judgment, views everyone living their choices. The realistic horse on the carousel emphasizes the significance of change. There comes the time, that decisive moment, when you decide to quit making the same mistakes that create the same negative situations. You can change what you acknowledge.